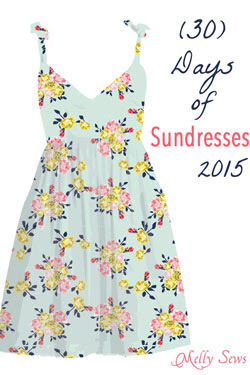 Welcome to my 30 Days of Sundresses post! I was so honoured to be invited to be a part of this fantastic lineup. And then for a while I was a bit paralyzed with fear, because hello, have you seen the participants? Many of these women I would consider my friends but I also consider them to be on a whole ‘nother level. Then life got insanely busy and one day I needed to just spit out something fast and fun for a little creative release, and I took pictures along the way just in case and here we are! The Free Spirit maxi was inspired by my daughter Olivia. 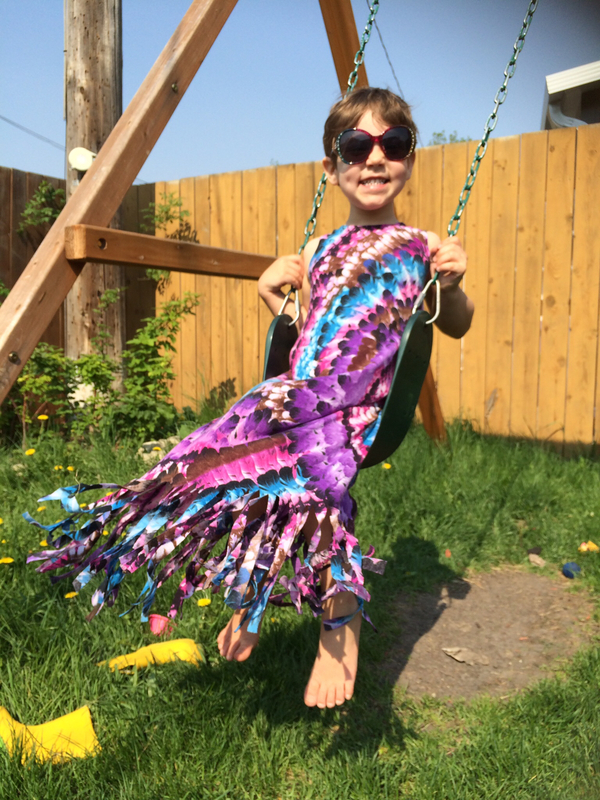 It’s purple – apologies to, well, you know who you are, twitching away – which she loves, and it’s also comfy and sassy and fun and free. And just a bit wild… which could be describing my wee girl, if I was puttings things mildly. 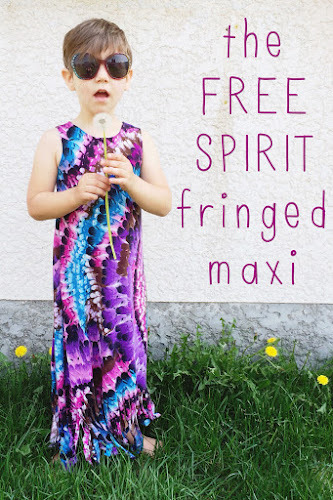 The Free Spirit whips up in an hour – really, this blog post will be way more time consuming than the dress – and the fringe is on-trend and super easy. 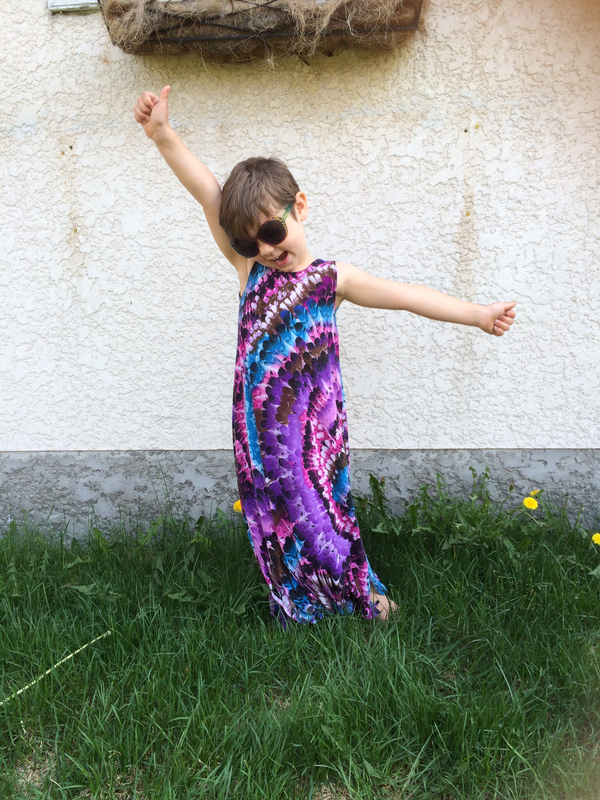 For this size 5 I used 2 yards of knit from Girl Charlee. 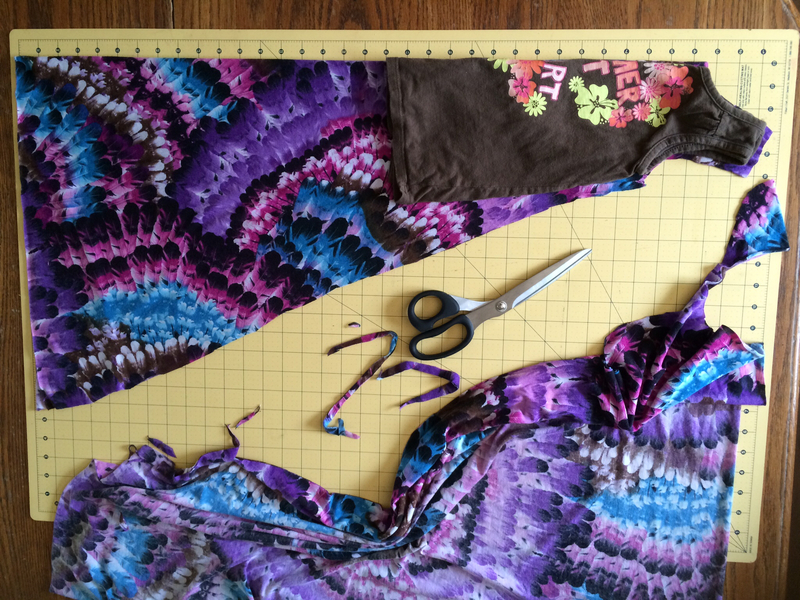 Anything bigger than a 5/6 and you may need to double the yardage of whatever dress length you are creating, to cut a wide enough dress. You want something medium weight to medium-light. If this is your first time using knits, stick to medium. 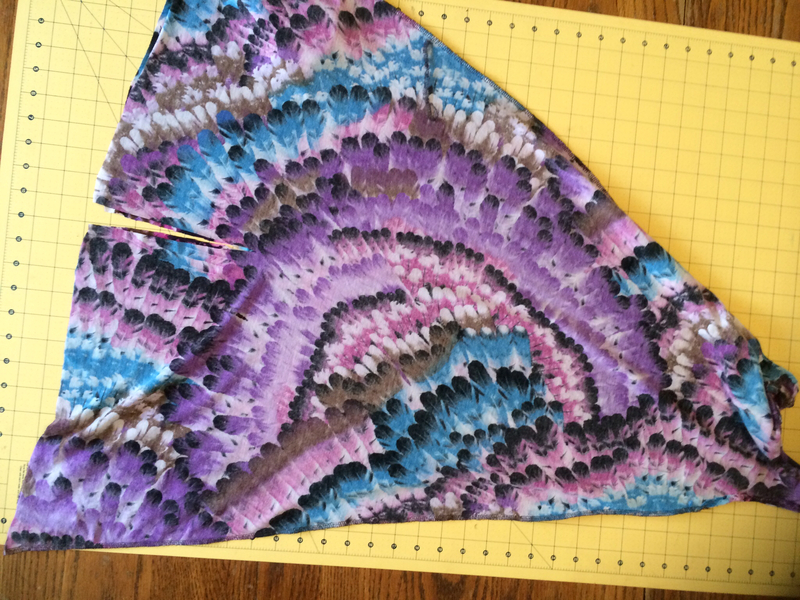 If you’re a little more masochistic comfortable with knits, this is really fun in something a bit lighter. You’re also going to want a tank top that fits the wearer well, not too snug but not oversized, either. You’ll use this tank to draft/freehand the dress. Ready to take a walk on the wild side with me? Let’s go. There are two ways to do this, super quick and easy and a little more properly but not too properly so we don’t lose our bad-boy reputation. 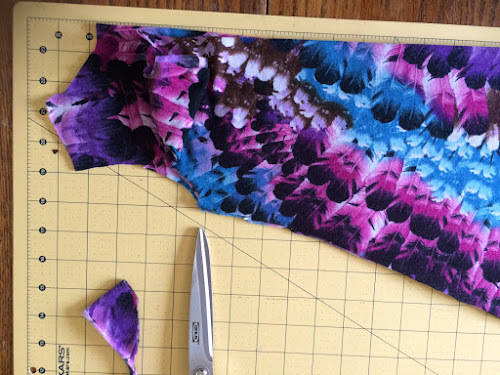 The easy way would be to layer your front and back pieces and cut both identically on the fold, using the front neckline of your tank as a guide. Feel free to do that, following these directions otherwise. The biggest difference will be a lower neckline in back and your shoulder seam may fall a bit differently. If this is a child’s dress (oh yes, my friend, theoretically you could do this adult sized) this will not have a huge impact on fit. 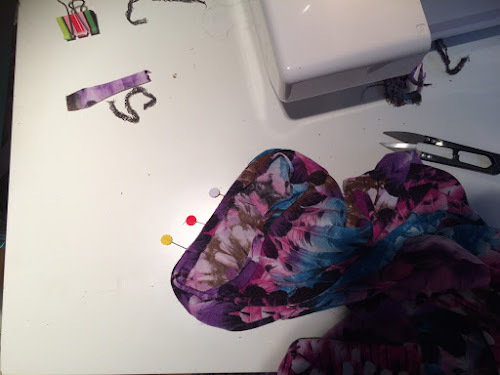 Otherwise, I would like you to lie your fabric folding the selvedges on each side into the centre to create two folded ends, then carefully fold your tank to trace and cut around the neck and arms – leave a seam allowance – then flare out to create the widest dress possible. You can see here my shape is awful – you want a straight line, and I do fix that later. Bear with me, I was winging this. Do this for both the front and back to create your dress pieces. After you’ve got front and back pieces, lie them on ttop of each other with the seams lined up at the underarms. 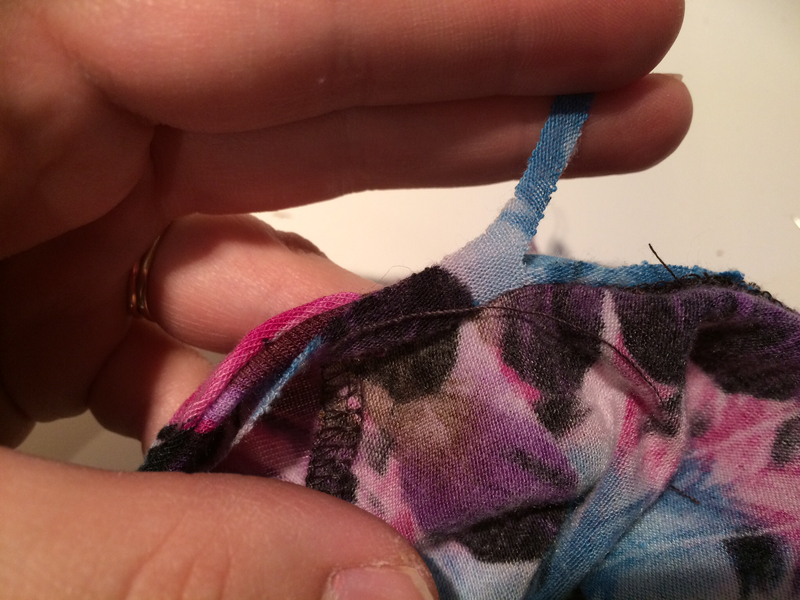 Now you can go back and neatly ensure your side seams are in a nice straight line. While you’re at it, measure and check the length of your dress. Use fabric scraps to cut strips of fabric about 1″ wide and as long as your fabric allows to make facing strips. 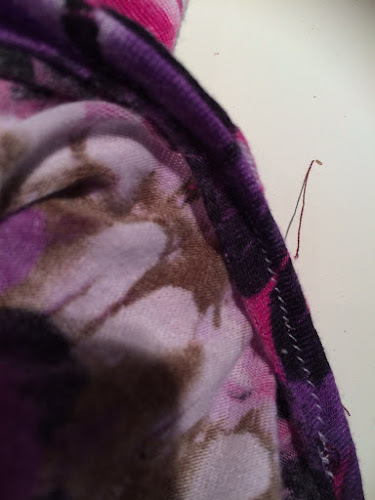 Sew or serge your shoulder seams together, right sides facing. Take one of your strips and cut about 1″ less than would go around your neckline. 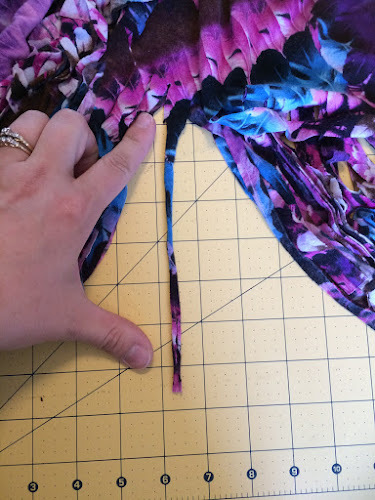 Sew your strip into a circle, right sides facing, then sew the facing to your neckline right sides facing. 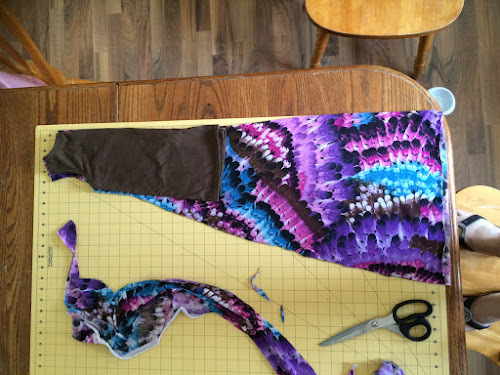 Use a stretch stitch or a long zigzag. Then fold and pin the strip to the inside of the neckline and sew it with a stretch stitch. You’ve neatly and easily finished the neckline! Sew or serge the sides of the dress and then use this technique to finish the armholes. 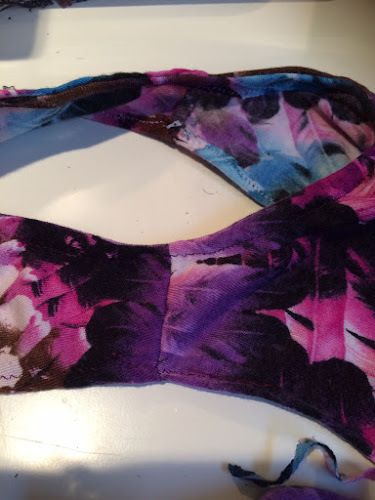 Or if you prefer, finish the armholes and then sew the side seams, if you’re more comfortable with that method. You can see below that my bobbin threads are white and my needle thread is black. This is almost probably for demonstration purposes and not because I’m a lazy bobbin changer. At this point you’ll be done sewing your dress! Wait, what? I’m serious! Finishing the hem is all about the scissors, baby. Check the fit of your dress, the length shouldn’t be any longer than grazing the feet of the wearer. 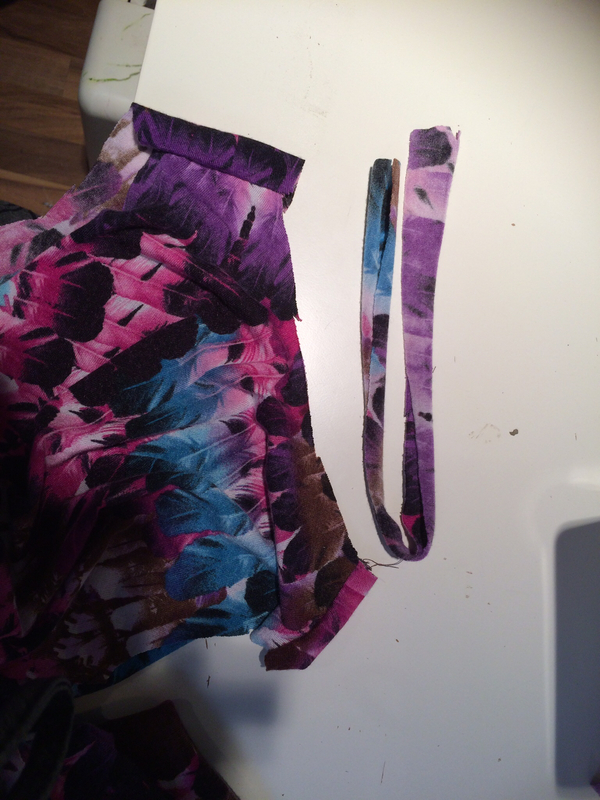 Then lay your dress flat on a table and brandish your scissors menacingly. Find the centre of your dress and start there, cutting strips 1/2″ wide. I cut about 6″ up through both layers. 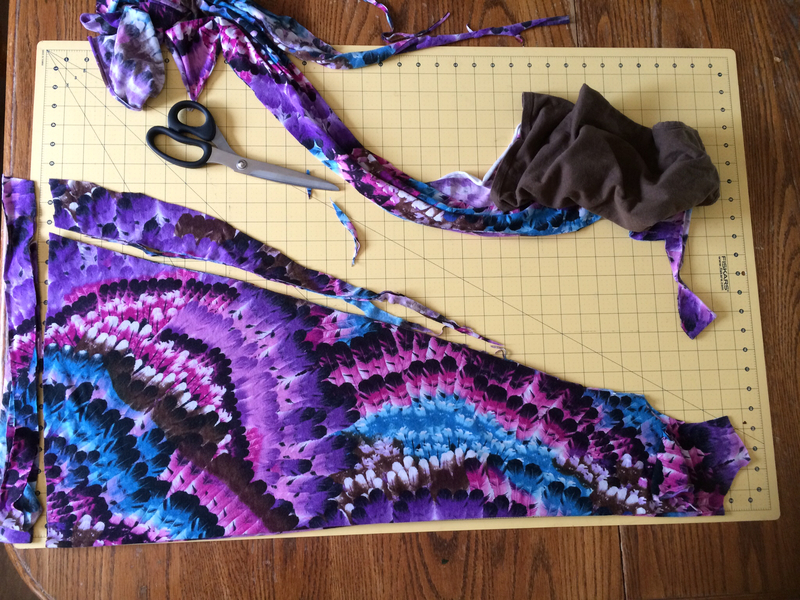 I’m going to ruin some blog magic and confess I cut 1″ wide strips, finished all the steps, then went back and cut each strip in half because it wasn’t enough. Trial and error – you get to skip that. 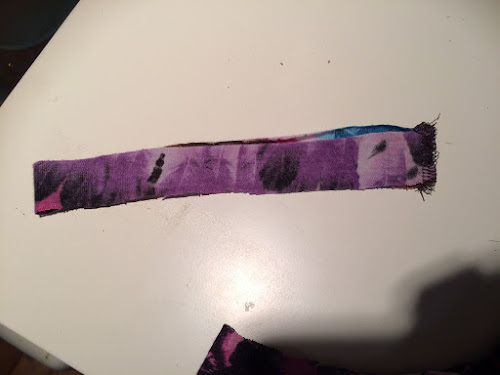 After cutting your strips, give them a good tug to get them to curl. When you’ve done that, your dress will be ready for anything! 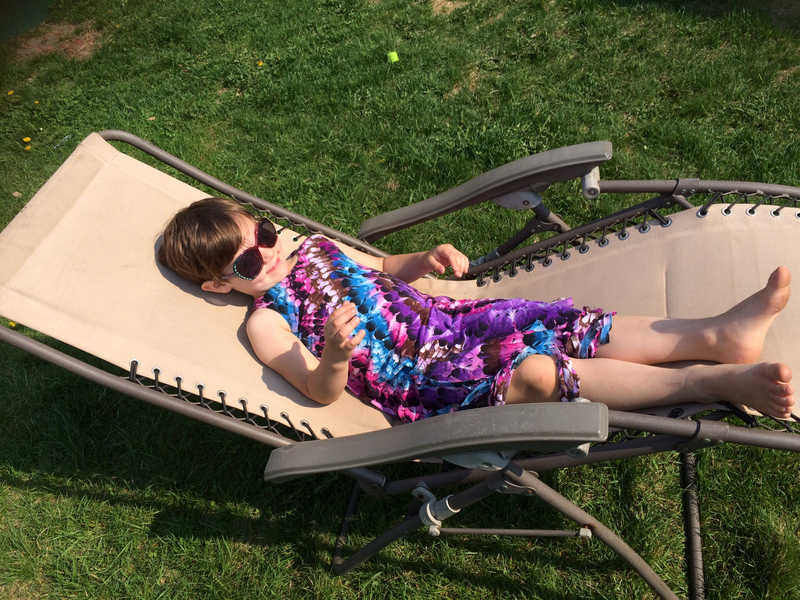 Now take a break, you’ve earned it, and be sure to enter the 30 Days of Sundresses giveaway-o-the-week here for your chance to win $24 worth of Blank Slate patterns!